Brice is the son of Killian and Jess, who were the hero and heroine in Trade Winds, your first novel for Choc Lit. What made you go back to, if not the same characters exactly, a member of their family for this book? I often find it hard to let go of characters once a book is finished and the temptation to continue with the next generation or another family member is difficult to resist. I’ve always loved books set in Scotland and read everything I can get my hands on about the Jacobite rebellion, which fascinates me. When I realised that Killian and Jess’s son would be coming of age only eight years after the battle of Culloden, I knew I had to write about him going back to his father’s homeland. And as I started to research this period in history, the more I read about the horrible way the Highlanders were treated, the more outraged I became. It was the perfect scenario for a hero – coming to take over an estate where he’s seen as an outsider, a potential enemy, even though he’s actually the good guy. Which usually comes first for you, story or character? A bit of both. My heroes are always based on a real person’s looks, so I need the spark of finding a new face to base a character on. Once I have that, I usually get the idea for one scene (in this case the one by the lake) and then the story takes off from that. Sometimes it happens the other way round, but with the same result. Trade Winds suggested from its title that the characters were subject to a steering flow, pulling them along towards their fate or destiny, just as a ship is in prevailing winds. Highland Storms makes it sound as if its characters are going to have an altogether more disturbed and turbulent time of things. Is that the case? They do have quite a rough time of it, but the title also refers to the volatile situation in the Highlands at that time and, to some extent, to the stormy relationship between the hero and heroine. In Trade Winds the characters were more subject to the vagaries of fate in that they entrusted their lives to a small ship sailing all the way to China. However, in both novels the characters have to rely on their own skills, wits and determination in order to fight for what they want. It’s just that they face different problems. Highland Storms certainly sounds just as intriguing as your previous books which I loved but, as my mother’s a Highlander, I’m especially keen to read a book set in one of my favourite parts of the world. Did you visit the Highlands while writing Highland Storms or rely on researching what it was like in the period in which the novel’s set? I did both – I take any chance I can get to visit Scotland, as I love it there and since it’s not that far away, research was a great excuse for going back. I drove around to look at the places I used as background for my fictional Scottish estate, and also up to Inverness and along the Great Glen to Fort William. I also visited several castles (it’s a hard job, but someone’s got to do it), to find inspiration for Rosyth House and I stuck my hand in a loch to make sure the water wasn’t too cold for swimming in. One of the great things about all your novels is how you get exactly the right balance between story and the amount of historical detail you include. Is it a continual juggling act to achieve this? Thank you, I’m glad you think I’ve succeeded! It is very hard to get the right balance and not bore the reader with too much detail, but at the same time it has to feel authentic so you have to include some. I’m lucky in that I have two wonderful critique partners who will tell me if I put too much or too little, but I also try and read it for myself as if I was a reader seeing it for the first time. Have you ever had to leave out a particular piece of research you wanted to include? Yes, lots of times. You come across so many wonderful snippets when you do research, but even if they seem very interesting at the time, they don’t always fit into the story. I don’t think they’re wasted though, they might make an appearance in another book. When I do research about a specific period or country, I type up everything I find and put it in a file in alphabetical order (ie. clothes, food, weapons, etc). So if I ever want to write about the same period again, I can go back through that file and perhaps use the piece of research that didn’t fit last time. All three of your novels for Choc Lit so far have been what’s known as historical fiction. How do you see yourself – as a historical novelist, or a novelist or storyteller who sets her books in the past or as something else entirely? I just see myself as a storyteller whose novels so far have happened to be set in the past. I do write other kinds as well and hope to have some other types of stories published one day. But from the feedback I’ve received over the years, I gather that historical stuff is what I do best, at least at the moment. The “how to” books always say write what you like to read yourself, and I admit I do tend to read mostly historicals, so perhaps that’s why? I’ve always been fascinated by history. Although you’re writing an historical novel, you’re also writing for a modern reader. Does that mean you take some liberties with the idioms and language you use or make compromises elsewhere to increase its appeal? Yes, I do think about how the language will sound to a modern reader. I used to write in a much more formal style, with long clunky sentences and lots of complicated words, but now I don’t. (I think I’d read too many Georgette Heyer books and unconsciously copied that sort of style). 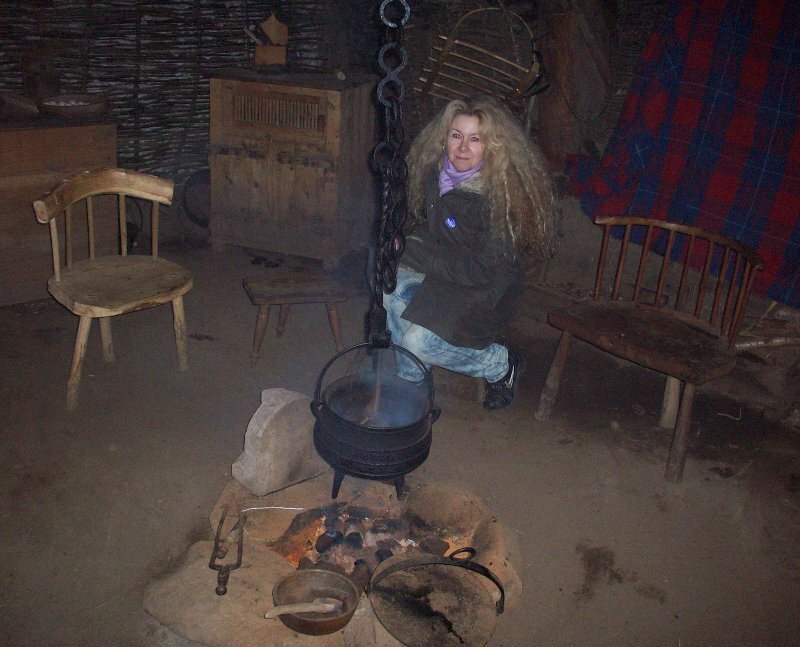 I also try not to let my characters use too much “historical speech” – only minor characters have dialects, while the main ones stick to using just a few authentic swear words and perhaps sentence constructions that are slightly different to what we would use now. It’s hard to find the right balance with that as well, I have to say, but my copy editor helps me out too – if she spots any words that would definitely not have been in use at that time, she’ll tell me, which is great. You don’t always see it yourself. Do you read historical fiction and if so, who would you say are your influences or favourite writers? Yes, historical fiction is still the genre I like best and I have lots of favourite authors who have all influenced me in different ways – Georgette Heyer, Barbara Erskine, Johanna Lindsey, Elizabeth Chadwick, Susanna Kearsley and Diana Gabaldon, plus many more. Do you read (historical) fiction while you’re writing one of your own books? No, I don’t read at all while I’m writing because it distracts me from my own story. I’m the kind of person who, if I start to read a book at tea-time, I’ll stay up until 4am to finish it because I have to know how it ends. So you can see that wouldn’t be very good while I’m supposed to be working on my own! What’s next for you and what are you currently working on? At the moment I’m working on a sequel to The Scarlet Kimono, which I hope the Choc Lit team will like (the same thing happened with that – I couldn’t quite let go of the family and the history of the time fit perfectly with what I intended). There is also a third book in each series planned (and partly written in one case) so I’ll need to do some research for those. That’s great news. I look forward to reading all of those! Thanks very much for coming back to The Nut Press to talk about Highland Storms. Squizzey and I wish you all the very best with it when it comes out next month. We’re sure it’ll be a great success. Thank you so much for having me again! Highland Storms (ISBN: 978-1906931711) is Christina’s third novel. You can read the first two chapters here and it is available to pre-order from Amazon UK, Amazon.com and The Book Depository. Christina’s previous novels Trade Winds and The Scarlet Kimono are also available from Choc Lit and all good booksellers. Trade Winds was short listed for the Romantic Novelist’s Association’s Pure Passion Award for Best Historical Fiction 2011. To find out more about Christina, you can read her Author Page, visit her Author Website or Follow Christina on Twitter. 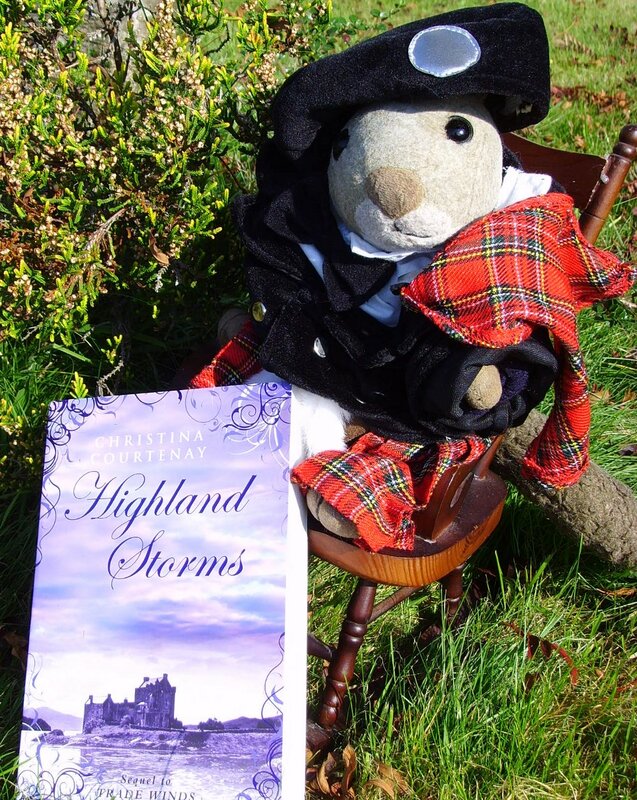 You can win a copy of Highland Storms. All you have to do is to make up a book title with a place name and a type of weather in it and Squizzey will choose the winner on Thursday 6th October. An interesting, in-depth interview, Christina and The Nut Press. Thank you for it. I think you’re allowed that, Liz, seeing as how you’re the first to comment! Thanks for dropping by and glad you enjoyed the interview. a place and a weather type? (I didn’t know whether one had to stick to a two-word format, or could use more). Ooh, I love Tuscan Tempest!!! Tuscany is one of my fave places, especially at this time of year when the chestnut harvest and festivals are in full swing. (And no, you don’t have to stick to the two-word format.) Thanks for entering! Thanks, Christina. It’s one of his favourites. I hid the bagpipes though, I couldn’t face them on a Monday! Thanks for starting things off here at The Nut Press – it’s always a pleasure having you to come visit. Great interview, thanks. I’m thrilled to read that Christina is writing the sequel to The Scarlet Kimono and can’t wait to read Highland Storms. I know! I’m excited about that one too, Debs, and good to know that it’ll form part of a trilogy, as will Trade Windsand Highland Storms, hopefully! 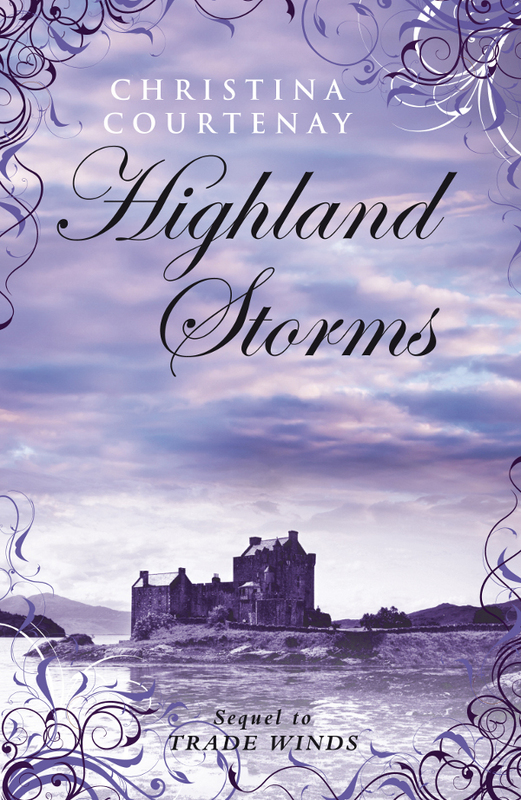 Fantastic interview, ladies – and another beautiful cover for Highland Storms! Squizz looks very spiffy, too. Thanks for all the lovely comments! I like the titles so far, but please keep them coming – I need one for the third book 🙂 (which unfortunately isn’t set in either Tuscany or Texas). Very good interview. I loved both books. Can’t wait to get my hands on this one too. Idea: How about The Spanish Thunder for a title? If the story in Spain? I so look forward to reading your new novel. I thought the questions great Pia including the one about language, which I may quote if that is OK with you. Will email U. As a title my offering is Wintering Out at Glennaquoich. I am looking forward to reading my copy of Highland Storms. We went to The Highlands for our holiday this year, my first time, and I fell in love with that part of the UK. Wish I was off to the Highlands too, such a lovely part of the world! Puddles in Paradise!!! Congratulations to Helen and thanks to everyone for visiting and taking part. Thank you Squizzey You’ve quite made my day – what a lovely surprise – I never win things!